Social inequality remains a key issue in health promotion to date. Empirical evidence on the role of material and non-material determinants of health and illness is mounting (Marmot & Wilkinson, 1999; Berkmann & Kawachi, 2000; Siegrist & Marmot, 2004). Under modern conditions of diversification and economisation in the health sectors findings from social epidemiology are essential to public health in general and health policy in particular. However, when examining social conditions relevant to the unequal distribution of health and illness, social epidemiology has traditionally focused upon either material conditions such as income, housing among others, or on social and psycho-social determinants such as education, social support, and psycho-social stress. Most often missing in public health research however, are cultural factors that link material and social resources, social structure and health. 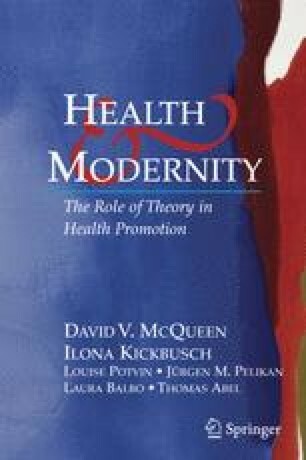 As health promotion focuses upon the development and maintenance of health in everyday life by the people themselves (rather than by medical experts), cultural factors become of central importance for theory development and practical interventions. For instance, health relevant behaviours are closely linked to broader value systems, behavioural norms, body perceptions among others, that may be typical for certain (sub-) cultures. They are adopted according to the environments in which people live, work and recreate and they are socially learned throughout the life course. However, from a sociological perspective the meaning of cultural factors is not limited to health relevant consumer choices for goods and services or explicit health and illness behaviours. Beyond such behavioural aspects, sociology has illustrated the crucial role that cultural factors play in the fundamental structuring processes of society (MaxWeber, 1978; Durkheim, 1997; Giddens, 1991; Archer, 1996). Rooted in social science theory, more recent studies from medical sociology have linked health relevant values, norms and attitudes to social class; applying sociological theories to understand the emergence and consequences of health related lifestyles (e.g. Abel, 1991; Blaxter, 1990; Cockerham, Rütten & Abel, 1997; Frohlich, Corin & Potvin, 2001).